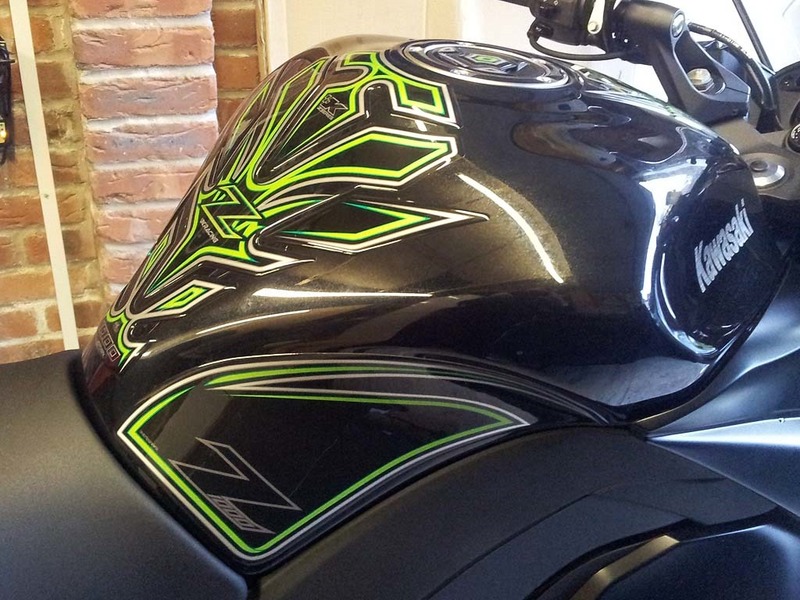 Helen has decided to bling up her Z1000SX with some Motografix tank protectors. She got the Kneepads KK020G kit and the Tank Protector TK016G kit. Obviously I had to fit the kit and being for Helen it had to be lined up with millimetre precision. The kits are high quality items and do justify the price she paid for them. I gave the areas a good clean and then wipe them down with alcohol wipes to remove and grease. After that I removed any trace of dust with a microfibre cloth and then warmed up the tank with a hairdryer. I also use the hairdryer on the gel pads to help them stick down. I had to lift up and reposition some of them a few times but with the aid of the hairdryer I manage to get them to stick down without any air bubbles. They look fantastic! Bold but subtle at the same time, I like it.